Bomi Joseph, a California plant breeder, is suing CBD Naturals, a company that has been associated with Canadian CBD manufacturer Isodi. Isodiol once held distribution rights to Joseph’s self-proclaimed innovation – a cannabidiol product derived from a hops variant. Joseph told Hemp Industry Daily that his creation has a huge market advantage because it doesn’t come from cannabis, meaning it may not face the same legal hurdles as cannabis-derived products. He said he has acquired a nursery in California to ramp up production of the CBD-rich hops plant that originated from a remote area of India. To Cristina Buccola – a New York lawyer who works in the cannabis space but isn’t involved in the lawsuit – the legal quagmire comes down to two companies that didn’t do enough preparation before going into business together. He is suing CBD Naturals CEO Jared Berry along with 10 unknown co-conspirators for which he uses “John Doe” names. Joseph is seeking $600,000 plus unspecified punitive damages for trademark infringement, unfair competition and deceptive trade practices. Joseph’s relationship with Vancouver, British Columbia-based Isodiol was brief. The companies announced a distribution agreement last fall and proclaimed that a game-changing CBD product was just around the corner. But the ink had barely dried on the November announcement proclaiming Isodiol would be selling the non-cannabis CBD when the companies split ways. Joseph terminated the agreement in April. In a letter to Isodiol, he complained that the company was wrongly taking credit for inventing the product, among other things. 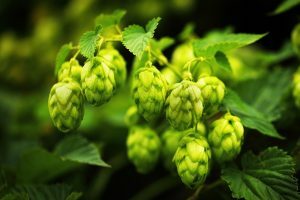 Isodiol says it is not currently selling or promoting any hops-derived CBD products. Isodiol said in a statement that the press release was not current, but did not directly refute the association with Berry. They also noted that the company acquired the domain name as part of its acquisition of Iso International LLC from Berry. 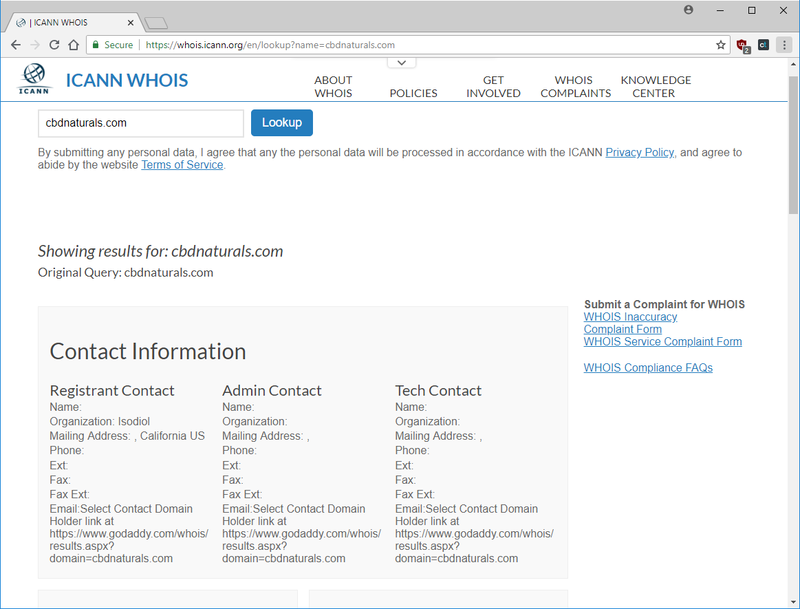 “Carlsbad Naturals LLC was using that domain name at the time of the Iso LLC acquisition,” an Isodiol spokesperson said in an email. 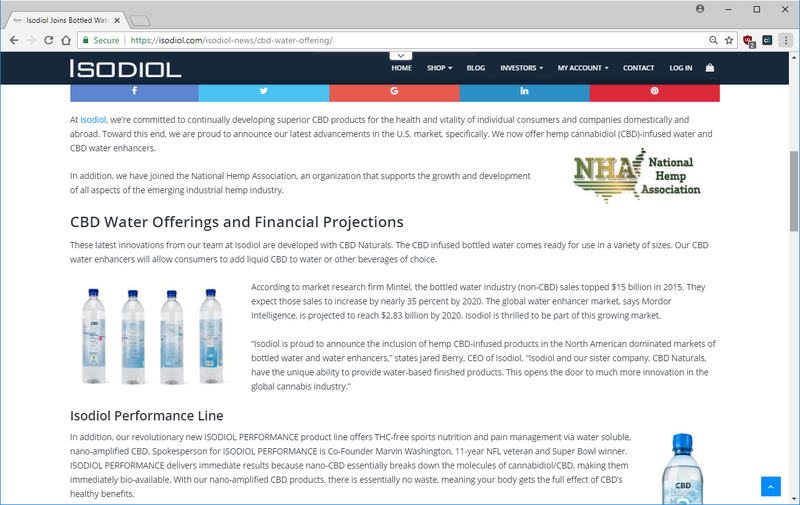 “…Isodiol only has a passive 19% interest in Carlsbad Naturals LLC and no other involvement in that company or the website maintained at www.CBDNaturals.com. “Looking at the terms of this (distribution) agreement, you can really see that things were left undefined and up to the parties as to what each side was expected to do and not do,” said Buccola, former general counsel for High Times magazine. Though Isodiol and Peak Health had a printed distribution agreement, the companies didn’t spell out things like how to resolve disputes. “A lot of times what we see in cannabis is that people like each other and want to work together and have these handshake agreements – and then things break down,” Buccola said. She said this case underscores the importance of having professionals draw up business partnership agreements. “Particularly when it relates to intellectual property, you want to be really persnickety and specific,” Buccola said. Because of tight regulations around the cannabis plants, some manufacturers have been researching other ways to obtain CBD. Other potential sources include hops, as represented in this lawsuit, as well as lichen, from which Grön CBD said it derives the product used in an infused chocolate bar. Success in creating more commercially viable sources could have a significant impact on the booming CBD industry by circumventing the strict cannabis regulations that currently exist. “Hops-based CBD doesn’t have that taint of being associated with marijuana,” Bomi said. No trial date has been set in the dispute, and CBD Naturals has not formally responded to the complaint. What a scam, it is highly unlikely any of these groups have found or developed a hop plant that produces cannabidiol. While not impossible, there isn’t a shred of credible evidence to suggest the noise made by these groups represents an actual breakthrough. Published in a so-called “science journal” with no known ownership and only in existence for 157 days. Well explained Anthony – that was my immediate first impression with this paper. I’m glad to see this issue discussed. The biggest concern with the paper was the use of a biological assay rather than an analytic assay to assess the presence of CBD. If they wanted to find CBD – they’d just do a cannabinoid analysis. If they wanted to suggest the possible presence of CBD they could use a bioassay with a CBD receptor, but this is much more work and not definitive. The most likely scientific interpretation – they’ve identified another compound that interacts with a CBD associated receptor. They claimed their extract had more activity than pure CBD. This could occur if it contained an agonist for that receptor, where CBD is a partial agonist. Beta Caryophyllene is well documented as acting on cannabinoid receptors and is present in both hops and cannabis. That at least provides a plausible mechanism to produce the reported results, and doesn’t require any rewriting of science to achieve. other vested interests who lack the basic education to do justice to this important field of study. Oddly enough I grow hops in western North Carolina and hemp for high concentrate CBD oil production in Ver5ont, and have laboratories In Rhode Island. Another double scamming the scammer. We REALY need standards and regulations in hemp–sooner the better for real growers.